The long awaited reconstruction of the Republic Square began today in Belgrade. Deputy Mayor Goran Vesic says that the works will take 420 days and that the development of the square itself will be completed by March 1, following which the development will start, causing the temporary closing of the streets for traffic. 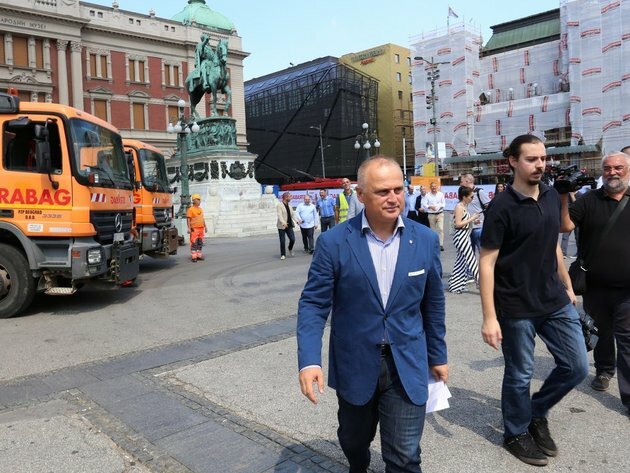 The works are worth RSD 922 million, and as Vesic announced, the development of the square marks the beginning of the expansion of the pedestrian zone in downtown Belgrade. – For the first time, the Republic Square will be formed as a true city square, with granite slabs. Around 150 physical obstacles will be removed – Vesic told the press while visiting the construction site. He also explained that the project encompassed Makedonska Street to the Belgrade Youth Center, Kolarceva Street nearly up to the point where it meets Terazije and Vasina Street. The project envisages two specially marked spots on the square itself – the former Stambol Kapija location and the place where members of the Red Army were buried in 1944, which will, as he says, make for “a bit of a trip through the history of the Republic Square”. – The contractor has been enabled to work for 24 hours, and the reason is that there are no residents here. The Belgrade Land Development Agency website already features a live video stream which allows citizens to see what is being done at each moment – Vesic said and announced that this practice of having cameras installed would be implemented in all major construction sites. He added that he expected Strabag, the contractor, to complete the works on time, although the development of the square “is not simple, as a lot of things there are protected by the Institute for the Protection of Monuments”. Vesic announced that an opera and ballet house would be built in the location of Staklenac and that the Ministry of Culture and Information should open an international contest, but he said that this would only take place several years later.